Festive restfulness, mature wits, shrewd phrasing intonation and taste, with absolutely no vocal bells and whistles. It’s Mrs. Flora Purim, Brazil’s gracious-sounding elder stateswoman. Speak No Evil is Purim’s latest. Her vocals, secure and succulent, convey enough exotica brushes in her accented musical fountainheads –and sonic conduits– to extend intimacy into the listening experience. She is the vocal jewel adorning a soloist and ensemble, manifested through her discerningly attractive and designed broche-like play. As danceable and Afro-Cuban as the group is in “This Magic”, with its flutist and percussive energetic drive and swinging montuno closing, they also perform outright Brazilian fare and some straight ahead materials. The players also ooze themselves into striking romance and sensuality in “Don’t Say A Word.” The sax soloing there has a welcoming tone and expression, framed alongside flute, piano and bass clarinet sweeteners. 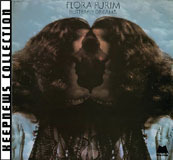 The performance of all musicians throughout the production, however, lives up to the reputation of Flora Purim and Airto Moreira, who is the bandleader.